Investigators from the popular PBS television series History Detectives followed clues from Illinois to the Pensacola National Naval Aviation Museum over the weekend. History Detectives host Elyse Luray came to Pensacola with a 1940’s airplane propeller found along a rural airstrip in Illinois, hoping museum experts could help her place the propeller in its proper historical context. Saturday, Luray interviewed Hill Goodspeed, curator of the museum, and Bob Bothfield who served as an engineer in World War II, about the mystery propeller. Working beside a rural airstrip, an Illinois man dug up the intriguing find: an eight-foot long wooden airplane propeller. A little research online made him believe that his propeller might be from a TDR-1 plane, a pioneering U.S. assault drone plane from World War II. Various websites say the TDR-1 were the first drones, the prototype of the unmanned assault planes used today in Afghanistan and Iraq. On the History Detectives episode filmed partially in Pensacola Luray will investigate whether this propeller is an important piece of American military history or simply fell off a local prop plane. The drone propeller story will air during History Detective’s ninth season during the summer of the year. History Detectives is seen locally on WSRE, channel 23. 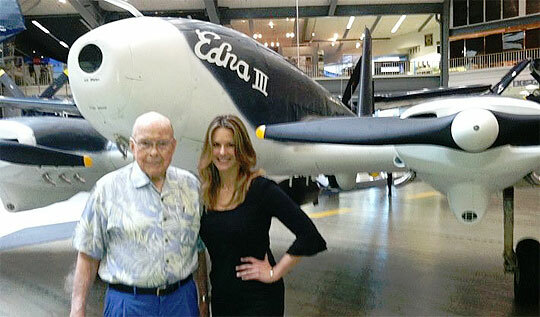 Pictured top: Bob Bothfield who served as an engineer in World War II, and History Detectives host Elyse Luray pose in front of a TDR-1 drone on display at the Pensacola National Naval Aviation Museum. Courtesy photos for NorthEscambia.com, click to enlarge. my father was a supervisor in the paint shop at american aviation in jamestown new york building this aircraft in 1943 &1944, i have an article on “facts about thermotite dopes and aero-tex fabric finish as used by american avtation corp., by leroy m. kellam,supervisor of paints and finishes. he also developed a spray gun that would reach through the holes in the spars inthe wings and stabalizers so they could spray dope all the way to the ends on the in side,for developing he recevied a 25 dollar war bond. I missed your progrom on WSRE and would like to view this program. Will it air in the future? Great info my wife and her family are from dekalb,I’ll. My mothers family are also from Dekalb,I’ll. I believe my Mother worked at wurletzer (sp) during that time frame. How can we see this Tv show we missed it! I sooo enjoy this show when I can get it. I love to watch this show !!!! you ca see some really neat stuff on here and learn something also! !